During the winter of 2009/10 the UK experienced prolonged spells of extremely cold weather (down to -20oC in some areas). This resulted in a significant increase in instances where the condensate drainage pipe from condensing (high efficiency) boilers had frozen - usually when the pipe had been installed externally for some of its length. Blockage due to freezing stops the condensate flowing to waste and causes the boiler to shut down. This note gives brief guidance for householders on what to do in this situation. Shutdown due to freezing and blockage of the condensate discharge pipe will usually be indicated by a “fault code” on the boiler’s digital display, or by some other alarm signal (check the boiler operating manual for advice on this). It is important to confirm that freezing is the cause of the problem before taking any of the remedial action suggested below. NB - the boiler manufacturer or the service company you use may have a helpline or website giving guidance on this. Ideally, remedial action should be carried out by a competent installer or service engineer – who will also be able to advise you on ways to help eliminate recurrence in future. Where it is not convenient to await such action, there are a number of methods which householders may wish to try in order to thaw the pipe and free the blockage - provided they feel competent to do so. It is likely that the pipe is frozen at the most exposed point external to the building or where there is some obstruction to flow. This could be the open end of the pipe, at a bend or elbow, or where is a dip in the pipe in which condensate can collect. The location of the blockage should be identified as closely as possible before taking further action. 2. Thaw the frozen pipe. The pipe can be thawed by applying a hot water bottle, a microwaveable heating pack (the sort used for muscular aches and pains) or cloths soaked in warm water to the exterior of the pipe, close to the point of blockage. 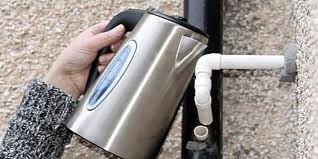 Warm water can also be poured onto the pipe from a watering can or similar container. Note: You should not attempt to thaw a condensate drain pipe which cannot easily be reached from ground level. Be aware that any water used can quickly freeze if it falls on pathways - causing a possible slip hazard. Once the blockage has cleared consult the boiler operating instruction, or check the manufacturer’s website, for guidance on any action needed to clear the fault code/alarm and re-start the boiler. If this does not succeed you should call in a competent engineer to assess the situation and take further action if required. If the pipe is successfully thawed and the boiler can be re-started then the following temporary remedial actions may help prevent re-freezing if the severe weather continues. (a) If the external pipe is not lagged as recommended (see (5) below) then you should try to insulate the pipe with suitable water-proof and weather-proof lagging, in order to prevent re-freezing. (b) During the cold spell it may help to run the heating system with the boiler thermostat (NB not the room thermostat) set to maximum. Turn back to the normal setting once the cold spell is over. (c) It may also help to temporarily set the central heating timer/room thermostat controls to “continuous” (24hr) mode, setting the room thermostat overnight to around 15oC. Again, return to normal settings once the cold spell is over. British Standards, Building Regulations and boiler manufacturers’ installation instructions allow condensate discharge pipes to run either internally or externally (or a combination of these). All the above documents give recommendations on how to run the pipe and how/when use insulation in order to reduce the possibility of freezing. However this may not have been sufficient to prevent freezing in extreme conditions of the type recently experienced.